Open and Airy Beach Apartment - just 20 steps from West Bay Beach! 1/15: The Boat House Beach Suite. Located on the ground level. 11/15: Guest bedroom with two twins & private deck. 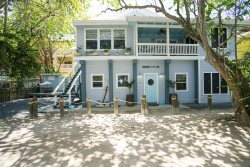 Boat House-Beach Suite is a 2-bedroom, 2-bath home in West Bay Village. The unit was remodeled in 2016 and designed with beach life in mind. The floor plan is open and airy with 9' ceilings and plenty of windows to let in natural light and airflow. Also included is generator power (in case of a power outage) and purified water throughout the home. Guests will enjoy using the new 6-burner gas stove and full-size oven, and the dishwasher will give you more time to relax after cooking up your favorite meals. The kitchen also offers plenty of space for extra chefs. Dining can be enjoyed with air conditioning at the table inside the house or outside on the porch. The porch, with numerous jalousie-style windows that are screened, is a popular place for guests to sit and relax. The open floor plan flows from the kitchen to the living area, which is bright and spacious with a comfortable couch and air conditioning, should you choose. The space can also be cooled with ceiling fans, should you wish to enjoy the island breeze. A 36" flat screen TV with local cable service provides video entertainment. The master bedroom has a king bed with a pillow top mattress and an ensuite bathroom featuring a tiled shower with glass enclosure. The second bedroom has 2 twin beds and glass doors leading to a private porch. Both bedrooms are spacious with great natural light, and they have separate AC units with remote control. A second bath also has a tiled shower and single vanity. Outside provides more deck seating and a large gas BBQ grill, and there is an outdoor shower for rinsing yourself and your beach gear. There is an additional unit upstairs with 2 bedrooms and 2 baths. Consider renting the whole home if you have a large family or group. Boat House-Beach Suite is located in the sanctuary of West Bay Village, a cozy collection of 8 Caribbean-style homes located right on West Bay Beach. Each home is private in its own space, yet close enough to your neighbor to make it easy for a quick visit. This area is popular with groups due to this convenient and private arrangement of the homes. There is a beach area that offers all WBV guests beach loungers and a marked swim area. The Boat House has a propane back up generator in case of power supply failures. The whole team was very friendly, knowledgeable, helpful and overall the right partnership for a complex such as this. Overall our stay was most enjoyable. We loved that we could just walk out the door and a few steps away was the beach. The property was quiet, clean, comfortable, decorated nicely, had adequate dishes and utensils, had a few welcoming gifts (eg.coffee, banana bread), comfortable beds. The water temperature could have been slightly warmer and the bathroom sinks/faucets could be changed out. However, the experience with the "Boat House" was terrific. Thank you, REPLY: Thank you, we are happy you enjoyed yourselves at Boat House, please come back again soon! The team was great to work with. Will definitely be back. REPLY: Thank you, we look forward to seeing you again! Loved the Boat house owners suite. REPLY: Thank you! This is my 5th time in West Bay, I recomend 100% Island House Vacation to have a great experience in Roatan. Beach is beutiful, houses are confortable and well kept, service and staff are great!!! The location is the best in Roatan!! We will come back every time we can!!! REPLY: It is always a pleasure to have you and your family stay with us. We look forward to the next time! We love West Bay Village!! all houses have their charm!! this is our Happy Place in the World!!! Discounts available for groups of 2 persons and extended stays. Unlimited purified drinking water provided. Check in time 3:00 PM, check out time 10:00 AM.